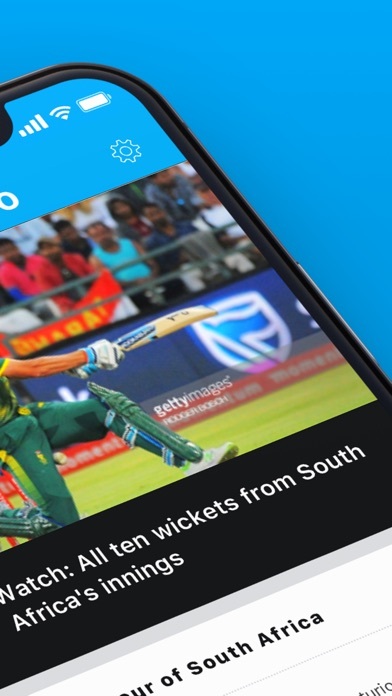 The new ESPNcricinfo is your personalised Cricket experience. We cover all T20, ODI, Test cricket tournaments across the world including IPL, PSL, BPL, BBL, CPL, ICC Cricket World Cup, County Championship, Ranji Trophy, Sheffield shield. 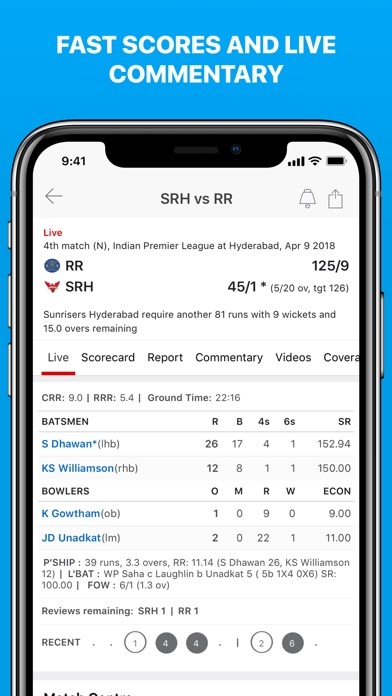 Get: - Ball by ball Cricket Scores, Live match Commentary - Notification updates for Live Cricket Match - Latest Cricket News - Cricket Videos including Highlights, Analysis, Interviews, Press conferences - Full Coverage of all IPL Cricket games, IPL News, IPL Videos, IPL schedule - One stop App for Test, T20, ODI Cricket - Personalize the App to follow your favourite teams- - ICC cricket teams like India, England, Australia, New Zealand, South Africa, Pakistan, Bangladesh & more - IPL cricket teams like CSK, MI, RCB, KKR & more Features: - World-wide Coverage: - Stay up to date on all ongoing and upcoming cricket matches. Be it domestic, India cricket or other ICC cricket, we got you covered. Get complete coverage of cricket news, IPL news under one roof. - Cricket Live scores with ball by ball commentary: - Never miss a ball with our all famous live scores and commentary updates. - Cricket Match Videos with expert opinions: - Watch a variety of cricket videos related to ongoing series, India cricket matches, cricket players and more. Get expert opinions of Sanjay Manjrekar, Ajit Agarkar, Aakash Chopra, Deep Dasgupta & more. 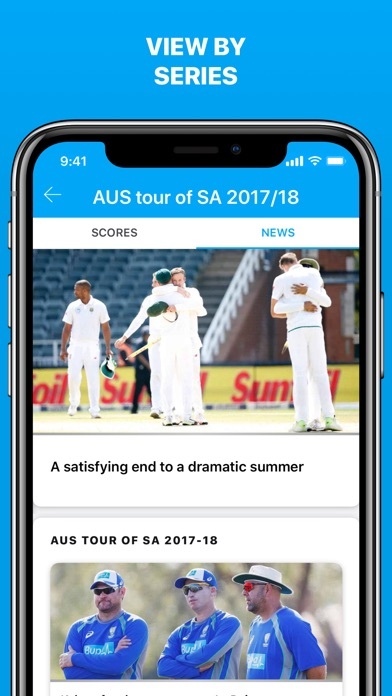 - Quick Cricket Match Updates & Alerts: - Get timely and accurate alerts from a live match or breaking news of your favorite cricket team. Be it IPL live, or ICC World cup live, we make sure you are notified for each ball delivered. Visit our website http://www.espncricinfo.com and follow us at @ESPNcricinfo on Twitter and like us at http://www.facebook.com/Cricinfo for the latest updates. 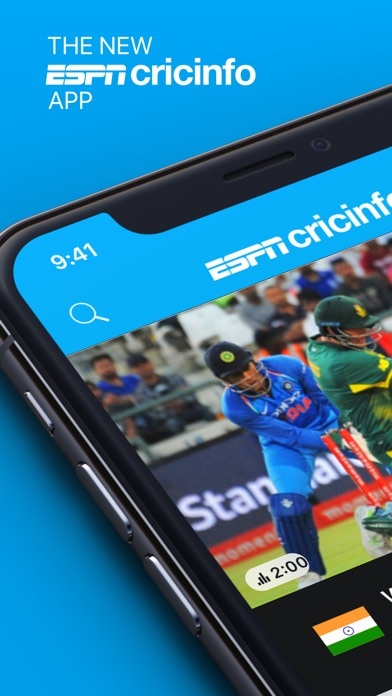 If you are a Football, NBA, F1 or any other sport fan, then download our ESPN app for Multi-Sports We would love to hear from you. For thoughts, problems or even praise, write to us at [email protected] or use the ‘Send feedback’ section inside the app. Before you download this app, please consider that it includes advertising, some of which may be targeted to your interests. You may choose to control targeted advertising within mobile applications by using your mobile device settings (for example, by re-setting your device’s advertising identifier and/or opting out of interest based ads). Cannot open Scorecard, Reports or any other links for Live matches. I would give it 0 star if I can. Very poor UX. There is cards, cards inside cards, videos, horizontal scroll, vertical scroll, banner ads, come on! What are we trying to achieve here? 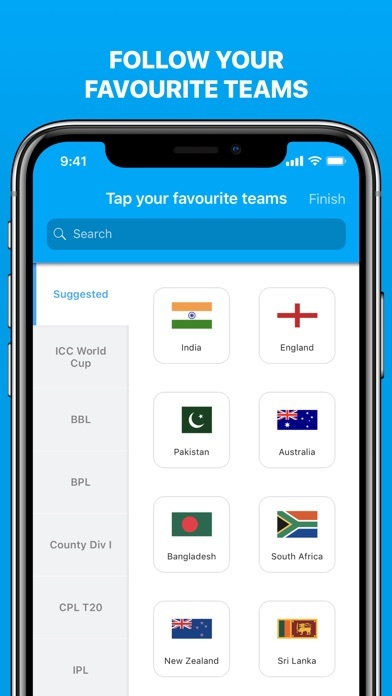 Sends alerts all day long even when 'Cricket Breaking News' alert is disabled and no favorite team is selected. Too much of the unfair slant towards India cricket. Everyone I go check a score I get bombarded with ads! What happened with this app? It is used to be very good, new version has too many bugs, erratic behavior and lost many good features. Do they even test their releases? I don’t usually take time out to write app reviews. But boy-o-boy has this app annoyed me. Top irritating bugs 1. Pop up announcing you won some BS 2. 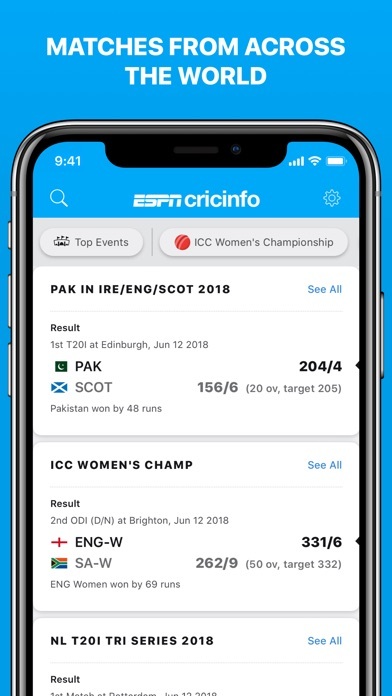 App/page will refresh randomly when you check scores 3. Links that go to desktop pages just give a 404 4. Ads before videos are annoyingly long and all videos auto play everything in sequence - WHY??? You either got rid of your old dev team and hired some noob or gave it to some contractor or just did not care enough. Either way I’m out. Btw look at the crap redditors give you cricinfo. You guys are going downhill. With the current app, I’m getting some random Walmart ads that states that I’ve won $1000 gift card. They seems like phishing attacks more than rewards and once you open the ad, you have to kill the app and then only you can access the app again. It wasn’t there until the last release of their app. Please fix this! Ads are fine, but full screen ads that don’t go away are simply annoying. Uninstalling the app just due to the spammy Walmart $1000 ad that doesn’t let you watch the scores. Deserves 0 stars and uninstall. App does. Ot provide intuitive visual and ease of use as actual website bit then that. Ot deal breaker. My major use of app was to see ball bu ball commentary and scores. In fist Ind vs aus odi in Sydney app keep popping up some spam windows stating that you won $1000 within seconds of opening score link. I tried at least 20 time. This stopped as soon as game was over. What use is app if I can’t use it. If popup was some add and goes away i can live with it, not spam. Speciall not in App. ESPNcricinfo may be the big player but it has become greedy with meaningless full screen banner advertisements. We have no option other than clicking them or quitting the app. Relaunch won’t help as the same thing repeats! HORRIBLE!! Update: Those full screen banner adverts popped up every freaking time and didn’t let me look at any score. I uninstalled it and switched to Cricbuzz. This pop up will not go away. Fake survey to grab your personal information. There is always one more step, requiring at least a $1 purchase which requires a credit card number. I had to stop at that point. This is completely fake. I deleted the app and restarted my phone. ESPN a Disney company must stop such fraud being committed on their App. Apple must remove this App from the App Store unless they fix and prevent such fraud. You know who I am. I am expecting response and results. I am not sure what legal recourse I may have. I should not need to use it with reputable brands like ESPN, Disney and Apple. This app used to be great but now has spam popup ads. Can’t use the app more than a few minutes without seeing the spam ads and then there is no way to close, cancel or dismiss the ads. It launches a web browser popup and then you can’t do anything except close the app and reopen it. The popup comes back in a minute again and you are stuck with this cycle. Developers when you see this I want to raise a bug that is causing issue in viewing score card. I am being greeted with a spammy message seconds after score card is loaded. There was no way to recover from it. I don't mind ads in the app as they support the team and makers. But recently cricinfo is showing obnoxious FULL PAGE banner ads that is impossible to get rid of. There is no close icon of button, and there is no way to dismiss it. After the upgrade, lot of junk stuff pops out like you won $1000 Walmart gift card..etc, there is no other way to click okay for it. The quality of app has gone worse on every update. The native app used to be very cool. Loading videos on home page is very bad. Looks like web view of the espncricinfo site responsive design. Too many ads popping every now and then is even worse. Create an app version without ads. Try to keep the app simple and easy. Don’t try to fill in too many stuffs like now. Moving to cricbuzz app which isn’t perfect but certainly better than this. Update after an Year, still same or even worse. Tried for a week and uninstalled again. This was a great app but now everytime I click on the scorecard a random app pops up.... really frustrating!! Stupid advertisements come up every time when I want to view the score . I end up using browser all the time . Very bad compared to the previous versions . I couldn't even get to live scorecard page because of full screen ads, even 25 tries. This is unacceptable for otherwise high-quality and reputable app. Take me to Walmart gift card scam page after clicking live scores. Cannot view any content or live score. Only thing I get is a full screen spam. The app has become useless. I keep getting Walmart Gift card notification. Always redirecting to some spam Walmart ad when I click on any live score. Reinstalling app does not work. It’s the worse experience. Every time I open the application to check the score, walmart ad pops up and forces me to close the application. So annoying!! The day I updated app, it’s started showing me spam ads which won’t go away until I click spam link. Like you win gift card and all. I am not against ads but putting spam in there pages doesn’t suit them. The recent update introduced spam and malware that can’t be closed. Recently when I am using this app this Walmart gift card pop up is coming up and asking for personal details.. it seems to be malware or virus.. please check..
Doesn’t let me go to scoreboard. Stupid Walmart app keeps coming. App deleted. This app is infested with spam. A popup ad takes over the entire app as I’m scrolling through the scores. I get that ads might be needed but please keep them discrete. You don’t need interstitial ads. The app has now started showing abusive scammy ads. The ads are similar to popup ads in scam websites. Please fix this. Intrusive ads on this app that keep popping up full screen automatically are so annoying. Won’t even let me see the scores, what is the use of such app. Not to mention the navigation links that were present in old app are all gone.